Updated for 2018, we managed to squeeze even more capability into this highly competent multi-tool. 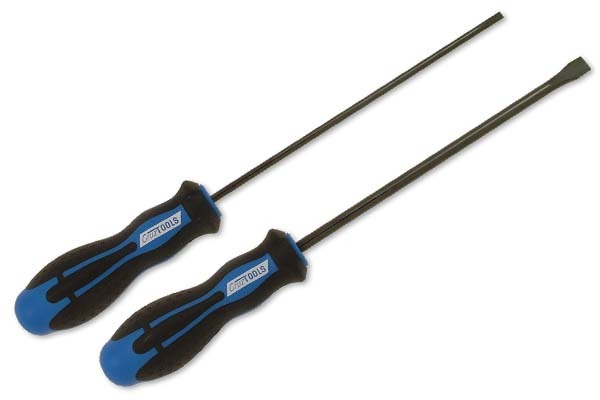 There’s still inch and metric hex wrenches, but with two sizes added. All truss rod sizes are ball-end. A 5/16” nut driver handles Gibson truss rods, and a ruler permits precise measurement. Also included are two Phillips screwdrivers plus a 2.5mm slotted scewdriver for vintage-style saddle screws. The one-piece body allows easy rotation and storage of components. All wrenches are pro-grade, using heat-treated S2 material with a polished chrome finish. PATENTS PENDING. Guitar players may know a little about truss rods and action, but few actually attempt adjustment. That’s a shame, because a good setup will improve your performance. The GrooveTech provides everything you need to work on your guitar, plus an Easy Setup Guide that takes the mystery out of the process. Eleven hex wrenches are color-coded gold for metric and black for inch sizes, and long pattern for easy access. All truss rod sizes are ball end. Also included is a thickness gauge, ruler, capo, GrooveTech String Cutters, string winder, and 6-in-1 screwdriver. Tools are lifetime guaranteed and pro-grade. Not wanting to leave bass players out, we developed an alternate kit optimized for low-enders. The hex wrench set is matched to virtually all bass makes, and the string winder has been removed to save a couple of bucks. Like its guitar brethren, the GrooveTech Bass Kit has top-shelf tools that are lifetime guaranteed, and stored in a pouch that will fit into most gig bags. An Easy Setup Guide will make you comfortable with truss rod, action, pickup, and intonation adjustment. After a few setups, you’ll immediately know when a minor tweak is called for. Our GrooveTech series kits are the ultimate for guitar and bass players, but weren't designed to be very portable. The Stagehand kit addresses this, with no loss in capability and at a modest price to boot! Central to the concept is a 19-piece magnetic bit set and screwdriver-style bit holder, with both inch and metric hex wrenches, screwdrivers, and sockets to handle virtually any make and model of guitar or bass. A capo and 15-blade thickness gauge with integrated ruler permit neck measurement, which is essential to proper truss rod adjustment. Also included are downsized string cutters and a string winder. Everything fits into an uber-compact pouch that is ready to hit the road. Guitar and bass strings are made of hardened stainless steel or nickel with thicknesses as high as 3mm. Ordinary diagonal cutters are designed for soft copper, and thus fail miserably when used on strings. GrooveTech String Cutters were developed specifically for this application, using a proprietary heat-treatment process. Despite its compact five-inch length, even “B” bass strings cut easily and your days of dented blades will be a thing of the past. Vinyl grips feel great in your hands. Vintage-style truss rod nuts have long, thin slots and are made of unhardened steel, so normal slotted screwdrivers will cause damage – as evidenced on many vintage guitars and basses. We developed two screwdrivers specifically for this application. Proper adjustment involves removal of the neck for full nut access, and our Standard Driver provides firm contact over the entire slot width for damage-free adjustment. The Cheater Driver™ allows quick minor adjustment without removing the neck (please see our recommendations for use). Both have oversized handles with extra-long shafts for a firm grip and easy access. GrooveTech, the GrooveTech Icon, StageHand, "Absolutely Dependable," "We Build Customers One Kit at a Time," and Cheater Driver are trademarks of GrooveTech Tools, Inc. Other trademarks are the property of their respective owners.